From one side, photo imitated painting for a long time but from another side it revealed and developed its own aesthetics and poetry by the works of its talented pioneers beginning from the first decades of its existence. It went along the way of its transformation into independent art but also it influenced over the other branches of art culture. At the beginning of the 20-th century, so called photo impressionism received a wide spreading. For this trend the utilization of gentle painting optics is typically. It washes out the contours of a subject, turns object into hazy indistinct bodies. By such indistinct contours the photo impressionists' close-ups are similar to impressionism in painting. In their works, subjects are hardly distinguished as though they are not crystallized from tender and thick haze, which floods the descriptive plane. Florensky said about impressionism in painting that subjects' cover was definitively exhausted for what "things stretch in space as smoke ghosts do" and "their material filling spreads all over the space". since 1963 lives and works in Poltava / Ukraine. since 2012 lives and works in Kyiv / Ukraine. since 2012 shef of the National Society of Photo Artists of Ukraine. 2016. "Shadows". House of architects.Kyiv.Ukraine. 2016. "Favorites". City exhibition hall. Kryvyi Rih. Ukraine. 2016. "The City Map". Gogol Public Library. Kyiv. Ukraine. 2016. "The sad story". Studio Museum of Photographic Art. Khmelnytskyi. Ukraine. 2016. "Kyiv diary." J. Greter Art-center. Kyiv. Ukraine. 2015. "Kyiv. The secret message". National Parliamentary Library of Ukraine. Kyiv. Ukraine. 2015. "Kyiv under attack". Dovzhenko Film Studios. Kyiv. Ukraine. 2015. "Raina". Gallery of Fine Art of Local Lore Museum. Lubny. Ukraine. 2015. "The Windows". Gallery of Fine Art of Local Lore Museum. Lubny. Ukraine. 2015. "The War". Art Gallery 14. Kyiv. Ukraine. 2013. "Lace of time". Regional State Universal Scientific Library. Kirovograd. 2013. "Turning the page". National Historical and Architectural Museum "Kyiv fortress." Kyiv. Ukraine. 2013. "The Nineties". Cultural Center "Vernisaj". Chernivtsi. Ukraine. 2013. "Recorded of silvers". Kupchinskyy Art Gallery. Rivne. Ukraine. 2013. "Memorable moments". Photogallery of Vasyl Pylypiuk. Lviv. Ukraine. 2013. "The Nineties". Center of culture and art. Kharkiv. Ukraine. 2012. "Independent dreaminess". City Exhibition Hall. Kryvyi Rih. Ukraine. 2012. "Light shade of sadness". Regional State Universal Scientific Library. Poltava. Ukraine. 2012. "Glitter". Art shop "Hundred Roads". Poltava. Ukraine. 2011. "Oneyroid". Gallery "Pro-photo". Poltava. Ukraine. 2011. "Flow of time". City Central library. Poltava. Ukraine. 2011. "The Nineties". Municipal gallery. Sumy. Ukraine. 2011. "Summer". Korolenko literary-memorial museum. Poltava. Ukraine. 2010. "Happiness exist!". Korolenko literary-memorial museum. Poltava. Ukraine. 2010. "Leningrad". Korolenko literary-memorial museum. Poltava. Ukraine. 2010. "Garden". Korolenko literary-memorial museum. Poltava. Ukraine. 2010. "Two". Gallery "Pro-photo". Poltava. Ukraine. 2010. "School". Korolenko literary-memorial museum. Poltava. Ukraine. 2009. "Pomaranch and other colors". Gallery "Pro-photo". Poltava. Ukraine. 2009. "Windows, doors". Gallery "Pro-photo". Poltava. Ukraine. 2008. "Selected". Regional State Universal Scientific Library. Poltava. Ukraine. 2007. "Silver classics". Regional State Universal Scientific Library. Poltava. Ukraine. 2007. "Maskaw". Korolenko literary-memorial museum. Poltava. Ukraine. 2007. " There after the grey line". Kotlyarevsky literary-memorial museum. Poltava. Ukraine. 2007. "Silver and gold". Panas Myrnyi literary-memorial museum. Poltava. Ukraine. 2006. "Light future". Municipal exhibition hall. Komsomolsk. Ukraine. 2006. "Larger than life". Gallery "Pro-photo". Poltava. Ukraine. 2005. "Life". Gallery "Pro-photo". Poltava. Ukraine. 2003. "Petersburg". Kotlyarevsky literary-memorial museum. Poltava. Ukraine. 2002. "Three books". Regional State Universal Scientific Library. Poltava. Ukraine. 2002. "Memoria". Kotlyarevsky literary-memorial museum. Poltava. Ukraine. 2001. "Spring". Kotlyarevsky literary-memorial museum. Poltava. Ukraine. 2000. "Unbearable joy of existence". Art salon. Poltava. Ukraine. 2000. "Photografiti". Kotlyarevsky literary-memorial museum. Poltava. Ukraine. 1999. "Nata". Kotlyarevsky literary-memorial museum. Poltava. Ukraine. 1999. "Dreams". Gallery "Pro-photo". Poltava. Ukraine. 1999. "Only yesterday..." Photogallery of Vasyl Pylypiuk. Lviv. Ukraine. 1998. "Euphoria of delirium". Kotlyarevsky literary-memorial museum. Poltava. Ukraine. 1998. "Only yesterday...". Photocenter "EXAR". Gallery "Portrait". Kyiv. Ukraine. 1998. "Once..." Public library. Komsomolsk. Ukraine. 1997. "Outside of photography". Local Lore Museum. Poltava. Ukraine. 1996. "Silver Age". Art salon Dolberg. Berlin. Germany. 1995. "Memoria". Art salon. Poltava. Ukraine. 1995. "Wish you were here". 21 gallery. (Pushkinskaya 10). St. Petersburg. Russia. 1994. "Provincial diary". State museum of Kyiv's history. Kyiv. Ukraine. 1994. "Photodiary". 21 gallery. (Pushkinskaya 10). St. Petersburg. Russia. 1993. Local lore museum. Poltava. Ukraine. 1993. Art museum. Poltava. Ukraine. 1989. "Nostalgia". Art salon. Poltava. Ukraine. 1989. "Five evenings". House of scientists. Dnipropetrovsk. Ukraine. 2015. "Ukraine - European Choice". National Historical and Architectural Museum "Kyiv fortress". Kyiv. Ukraine. 2015. "Independence Day". National Parliamentary Library of Ukraine. Kyiv. Ukraine. 2015. "My Ukraine". National historical-architectonic museum "The Fortress of Kiev". Kyiv. Ukraine. 2014. Exhibition of Photographers of Poltava dedicated to the 20th anniversary of the regional organization of the National Society of Photo Artists of Ukraine. House of Trade Unions. Poltava. Ukraine. 2014. Exhibition dedicated to 200th anniversary of Taras Shevchenko's "Love Ukraine!" National Historical and Architectural Museum "Kyiv fortress." Kyiv. Ukraine. 2013. "Biruchiy." Exhibition Hall of regional organization of the National Society of Photo Artists of Ukraine. Zaporizhia. Ukraine. 2013. "Touchstone". Gallery of Modern Art Lenin. Zaporizhia. Ukraine. 2012. "Three Views". Regional State Universal Scientific Library. Poltava. Ukraine. 2012. "Kirovograd Region". The project "My flowering Ukraine." Regional State Universal Scientific Library. Kirovograd. Ukraine. 2012. "Independence Day". Exhibition of the National Society of Photo Artists of Ukraine. Gallery EvroPhotoArt. Chernivtsi. Ukraine. 2012. Exhibition of the regional organization of the National Society of Photo Artists of Ukraine. House of Trade Unions. Poltava. Ukraine. 2012. "Twos". / "Female Portrait". Regional State Universal Scientific Library. Poltava. Ukraine. 2012. "Podillia 2011". Regional Museum. Vinnytsia. Ukraine. 2011. Chamber of Commerce and Industry of Romania Building. Exhibition of the National Society of Photo Artists of Ukraine. Bucharest. Romania. 2011. "Sense". Coralli gallery. Lviv. Ukraine. 2011. XVI exhibition of National Society of Photo Artists of Ukraine. Art center "Art plus". Kyiv. Ukraine. 2011. "20th Independent Day". Art center "Art plus". Kyiv. Ukraine. 2011. "Killing Photography". The "Kvartira" Gallery Art Centre. Dnipropetrovsk. Ukraine. 2010. "Two looks on the Ukrainian picture". Gallery "Gayday" ("Camera"). Kyiv. Ukraine. 2010. "Killing Photography". The "Ya" Gallery Art Centre. Kyiv. Ukraine. 2010. "Speak" ("7 I"). Moscow house of nationalities. Moscow. Russia. 2010. "Portrait as occasion". L-gallery. Moscow. Russia. 2010. 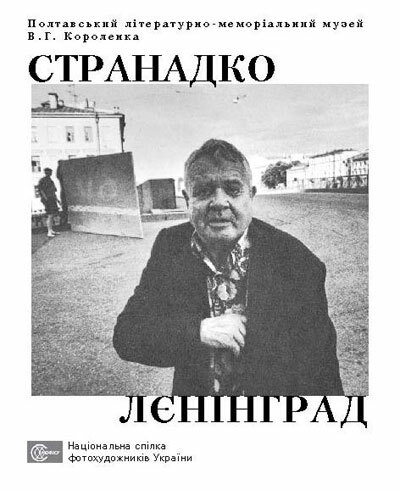 "Ukrainian photography : 1989-2009". Gallery of Arts Support Fund. Kyiv. Ukraine. 2010. International Festival "FotoFuture-2009". Gallery "Vystavok net". The center of the modern art "Vinzavod". Moscow. Russia. 2009. "Ukrainian photography : 1989-2009". Month of photography in Bratislava. Cathedral Clarisky. Bratislava. Slovakia. 2009. Presentation of project: "Ukrainian photography: 1989-2009" to Month of photography in Bratislava. Gallery "A-House". Kyiv. Ukraine. 2009. "Crossing". TRC "Kyiv". Poltava. Ukraine. 2008. "Ukrainian Independence Day". Fernbanks Lodge. Cincinnati. USA. 2008. Exhibition of Photoartunion of Poltava. Kotlyarevsky literary-memorial museum. Poltava. Ukraine. 2008. "Insight". Gallery "House of Mykola". Kyiv. Ukraine / Gallery "Dzyga". Lviv. 2008. "Author New-year postal". Regional center of folk creation. Kharkiv. Ukraine. 2007. "Photo Essay of Eastern Europe". Eastern European Festival. Art Museum. Cincinnati. USA. 2005. "Kyiv Digi Photo Show". Kyiv Expo Plaza. Ukraine. 2005. "The N Territory". Regional State Universal Scientific Library. Poltava. Ukraine. - Museum of city sculpture. St. Petersburg. Russia. - "Home Away from Home". New York. U.S.A.
- "Death". London. United Kingdom..
2004. "Poltava. People. City. Time." Art museum (Contemporary art gallery). Poltava. Ukraine. 2003. "Aqua mater". Kotlyarevsky literary memorial museum. Poltava. Ukraine. 2002. "Sho". Regional State Universal Scientific Library. Ukraine. 2001. "Memory about nonentity civilization". Gallery "Block "A". Kyiv. Ukraine. 2001. Project "Museum of photography". Municipal art gallery. Kharkiv. Ukraine. 2000. "Ukraine on the eve of XXI century". Gallery "Krok". Kyiv. Ukraine. 2000. Exhibition of masters photography. Trade Union's House. Poltava. Ukraine. 2000. Exhibition of football photography. Chess-draughts club. Poltava. Ukraine. 1999. "District of Poltava: pages of history". Local lore museum. Poltava. \ Palace "Ukraine". Kyiv. Ukraine. 1999. "Travel in time". Kotlyarevsky literary memorial museum. Poltava.\ Komsomolsk. Public library. Ukraine. 1999. "The Art is not exists". Gallery "Parsuna". Poltava. Ukraine. 1999. "The best masters of photography in Poltava". Gallery "Pro-photo". Poltava. Ukraine. 1998. Exhibition masters of photography. Art Museum. Poltava. Ukraine. 1998. "Keep moment". Donetsk, night club "Chicago". / Dnipropetrovsk, night club "Antre". / Lviv, artcenter "Dziga". / Kharkiv, "Center XXI". / Odesa, night club "Rio". / Kyiv, night club "Shelter". Ukraine. 1998. "Day from life". Center of the modern art of Soros. Kyiv. Ukraine. 1998. "Ukraine of my, Ukraine!" National library. Kyiv. Ukraine. 1998. "The body". Photocenter "EXAR". Gallery "Portrait". Kyiv. Ukraine. 1998. Exhibition of sport photography. Local lore museum. (Grand-prize). Poltava. Ukraine. 1998. "Exhibition". Gallery "Parsuna". Poltava. Ukraine. 1998. Gallery "Dah". Kyiv. Ukraine. 1998. "No comment". Photocenter "EXAR". Gallery "Portrait". Kyiv. Ukraine. 1998. Exhibition of creative photography. Local lore museum. Myrgorod. Ukraine. 1997. The Fifth international biennale "IMPREZA-97". Ivano-Frankivsk. Ukraine. 1997. "Promotion Ukraine". Ukrainian house. Kyiv. Ukraine. 1997. 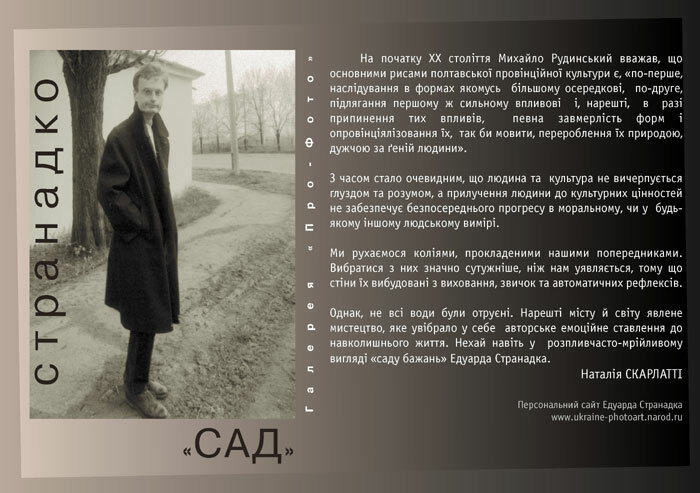 Two exhibitions of Poltava photoartists. Feodosiya / Yalta. Crimea. Ukraine. 1997. Exhibition Ukrainian's photoartists. National library. Kyiv. Ukraine. 1997. "Mode of life and people's traditions of Ukraine. Second National competition. Art museum. Poltava. Ukraine. 1997. The Second national competition of art photography. Museum of ethnography and art industry. Lviv. Ukraine. 1997. "Sorotchinska`s market..." Trade Union's house. Poltava. Ukraine. 1996. Photobiennale. Museum of contemporary art. Tegeran. Iran. 1996. "The love of art all three". Art salon. Poltava. Ukraine. 1996. "Vision art". National art museum. Kyiv. Ukraine. 1996. National exhibition photo-cinema documents "10-th years of Chernobyl catastrophe". Kyiv. Ukraine. 1996. Art salon. Poltava. Ukraine. 1996. The Fourth international biennale "IMPREZA-95". Ivano-Frankivsk. Ukraine. 1995. "The Four personal exhibitions of New provincial Art". Gallery "Parsuna". Poltava. Ukraine. 1995. "Strange photography". Photogallery "Na Uzvozi". Kyiv. Ukraine. 1995. "Subjective photography". Photogallery. Zaporizhia. Ukraine. (Award). 1995. The Second international exhibition of creative photography. Kotsyubinski museum. Vinnitsya. Ukraine. (Award). 1995. "Mode of life and people's traditions of Ukraine". Local lore museum. Poltava. Ukraine. (Award). 1995. The First national competition of art photography. Museum of ethnography and art industry. Lviv. Ukraine. (Award). 1995. "Impreza-photo'95". First international biennale. Museum of regional studies. Ivano-Frankivsk. Ukraine. 1995. "Psycheterror". 21 gallery. St. Petersburg. Russia. 1995. "New provincial art". Gallery "Parsuna". Poltava. Ukraine. 1995. "International exhibition of creative photography". Vinnitsya. Ukraine. 1995. The First national photographic competition "Nature'95". Museum of regional studies. Ivano-Frankivsk. Ukraine. 1995. Exhibition of cult art. Local lore museum. Poltava. Ukraine. 1995. "St. Petersburg: a view from outside". State museum of the St. Petersbursg history. Russia. 1995. "Salon of young's". Art salon. Poltava. Ukraine. 1994. Art salon. Poltava. Ukraine. 1994. "Ukrpressphoto". Ukrainian house. Kyiv. Ukraine. 1994. "Subjective photography". Photogallery. Zaporizhia. Ukraine. 1994. "West-Ost". Gallery "Lichtblik". Leonardo-Zentrym. Koln. Germany. 1994. "Nature'94". Museum of regional studies. Ivano-Frankivsk. Ukraine. 1994. Exhibition of photoclub "Dnipro" (Dnipropetrovsk). Local lore museum. Poltava. Ukraine. 1993. "The Second St. Petersburg's kunstsalon". Berlin. Germany. 1993. "World around us". Ukrainian house. Kyiv. Ukraine. 1993. "Wardrobe". Central exhibitions hall (Manege). St. Petersburg. Russia. 1993. "The Contemporary self-portrait". Central exhibition hall (Manege). St. Petersburg. Russia. 1992. "Landscape". Ukrainian house. Kyiv. Ukraine. 1991. The first international competition for creative photography "Vinnytsia-91". Exhibition Hall of the Artists Union of Ukraine and the Hall of literary-memorial museum of Michael Kotsubynsky. Vinnytsia. Ukraine. 1991. "Photomanifesto". Contemporary photography of the USSR. Museum of contemporary art. Baltimore. USA. 1991. "Photographers of perestroika". Long Island University. USA. 1991. "Landscape". Ukrainian house. Kyiv. Ukraine. 1991. "Pain of Chernobyl". Ukrainian house. Kyiv. Ukraine. 1989. "150 years of photography". History museum. Dnipropetrovsk. Ukraine. 1987. Center of Abovyana. Yerevan. Armenia. Exhibition of photoclub "Dnepr"
1986. Museum of photography. Shaulai. Lithuania. Exhibition of photoclub "Dnepr"
1986. Photogallery. Kaunas. Lithuania. Exhibition of photoclub "Dnepr"
2014. Magazine "Ukrainian Culture" # 6 (1026). "The game is on the verge of Instagram." Kyiv. Ukraine. 2012. Magazine "Photographer" # 11. "Other values of photographers unmercenaries." Kyiv. Ukraine. 2012. Magazine "Photographer" # 9-10. "Noctambulant prints of reality." Kyiv. Ukraine. 2008. Book "Insight". Ukrainian black and white photography. XXI. Kyiv. Ukraine. 2000. Book "Only yesterday..." Poltava. Ukraine. 2000. "Trud-Ukraine". #242 (28.12.2000) Kyiv. Ukraine. 2000. "Stolichnuye novosti". #100 (18.01.2000) Kyiv. Ukraine. 1999. "Segodnya". 24.07.1999. Kyiv. Ukraine. 1998. "Top photo". #2. 1998. Kyiv. Ukraine. 1997. "Nezavisimost". 08.10.1997. Kyiv. Ukraine. 1995. "Nezavisimost". 15.11.1995. Kyiv. Ukraine. 1993. "Svitlo i tin" (Light and Shadow). #4. Lviv. Ukraine. 1992. "Svitlo i tin" (Light and Shadow). #4. Lviv. Ukraine. 1991. "Photomanifesto". Contemporary photography in the USSR. Stewart, Tabory & Chang. New York. USA. Finnish National Gallery. Helsinki. Finland. The Forbes collection. Boston. USA. 2012. State grant. Ukraine. 1 year. 2007. Honoured Worker of Culture of Ukraine. 2006. State grant. Ukraine. 1 year. 1997. Ukrainian Journalists Union member. 1997. St. Petersburg. Russia. International conference: "Photography yesterday and today". 1995. Grant of "Laboratory life". 1 month. St. Petersburg. Russia. 1995. Special Kodak prizes for the best Ukrainian authors. "International exhibition of creative photography". Vinnitsya. Ukraine. 1995. Special price. "Mode of life and people's traditions of Ukraine". Poltava. Ukraine. 1995. Grant of "Light and Shadow" (photomagazine). Lviv. Ukraine. 1991. Grant of Ana Agarski. 4 month. Berlin. Germany. 1989. National Society of Photo Artists of Ukraine (NSPAU) member.